A Mediterranean themed food station included healthier selections like hummus, artisan breads and fresh veggies. Late last year, senior living firm Phoebe Ministries put on an open house for prospective clients of its planned newest site, to be opened on the former headquarters campus of publishing firm Rodale in Emmaus, Pa., which Phoebe purchased last year. The new community, to be called Chestnut Ridge at Rodale, is designed to be a wellness-centered community targeted especially at younger seniors who want to maintain an active, healthful lifestyle, appropriate for a facility located on a campus formerly owned by a publishing firm that specialized in health and wellness literature. 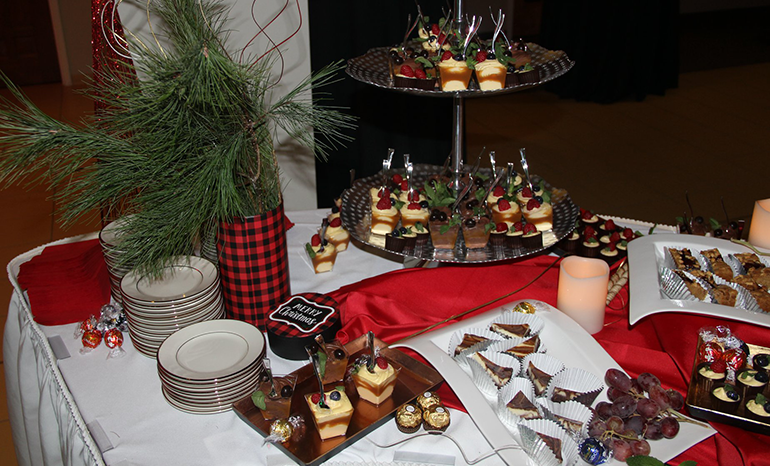 The event had a holiday theme and was catered by Cura Hospitality, a unit of Elior North America that provides dining services at Phoebe sites. Held between 5 p.m. and 7 p.m., it drew over 250 despite some inclement weather. 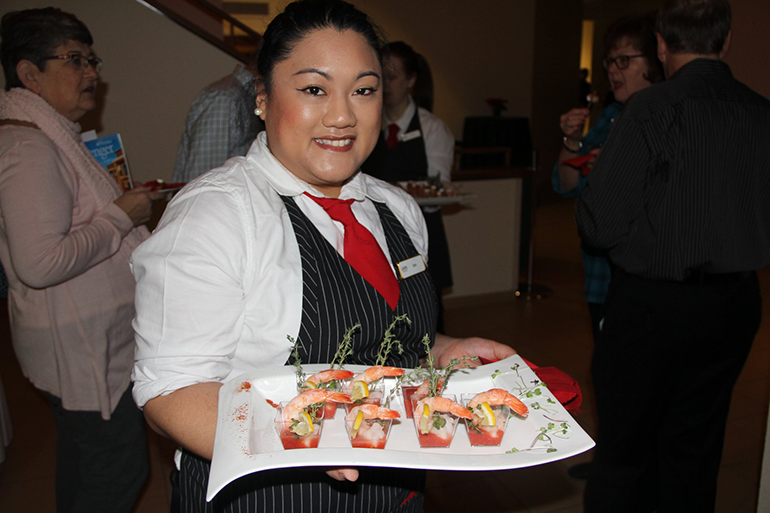 Passed hors d’oeuvres as well as a carving station introduced guests to Cura’s culinary capabilities. As it was not a sit-down event but rather a demo approach that allowed attendees to pick and choose, Cura set up various stations, such as a Mediterranean table with roasted vegetables—a big hit, per Crossin—hummus, artisan breads and healthy oils like olive oil. There were also passed hors d’oeuvres featuring shrimp, scallops and so forth. “We tried to emphasize healthy where we could and also local [foods] even though that’s a little difficult in Pennsylvania [in winter],” Crossin notes. And because of the holidays, several stations had traditional items like turkey and beef tenderloins carved to order. These were enhanced with add-ons like caramelized onions and chutney for the tenderloin and cranberry chutney sauce for the turkey. There were also two signature drinks created especially for the event: rosemerry, gin and tonic and winter sangria. A unique touch was roasted chestnuts served as a parting gift, passed out by an attendant in Victorian costume. 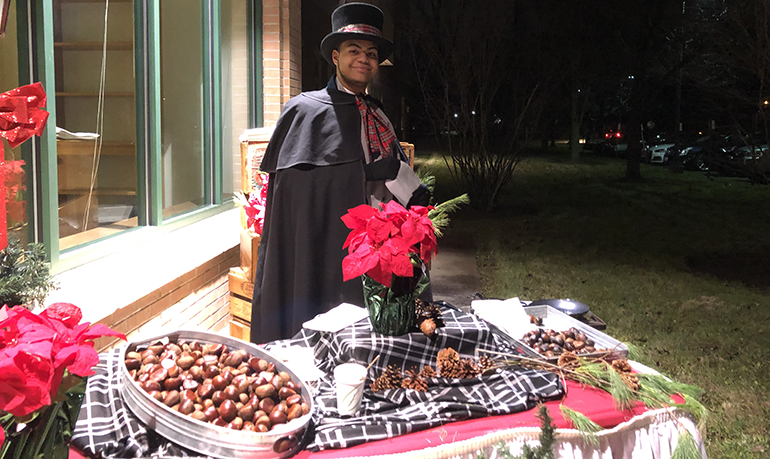 A signature touch to cap the evening was a Victorian-garbed staffer serving roasted chestnuts as a parting gift. It seems to have done it job, judging from the reactions of the attendees.